At the end of September 2015 Google announced the arrival of Customer Match. Now I am sure anyone who works in paid search was jumping high off the ground when they read about this update as this is a feature that I believe can truly revolutionise how we use paid search marketing on Google. This is something that I have longed for over the years but I didn’t ever think Google would do considering their stance on customer privacy but hey, I am not complaining. For those of you who don’t know, let’s start by looking at what Customer Match actually is. Essentially within AdWords you can now upload a list of email addresses from your database and Google will match those against its own database. Any identical matches can be applied as an audience segment and utilised on the Search Network, Gmail Ads and on YouTube. A study that Wordstream conducted when the new feature was announced showed that Google were about to match just over 50% of the 357,000 email addresses that Wordstream uploaded. 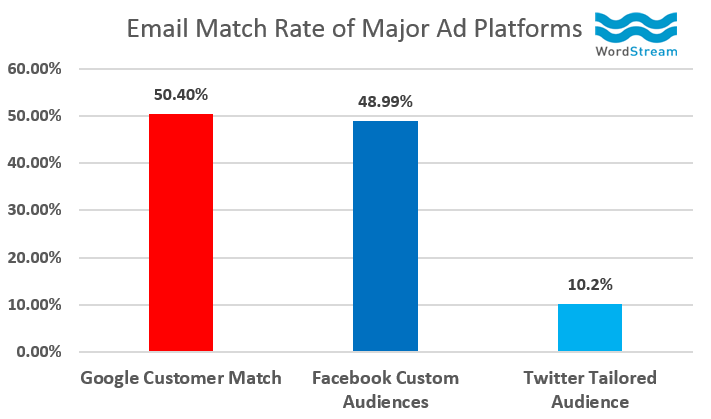 Compared with Facebook, Google were able to match slightly more and compared to Twitter, they were able to match significantly more. This graphs highlights this visually for you. I have yet to really try this new feature out fully yet given it is only being rolled out to all AdWords Accounts over the next few weeks. Once I found out that this would be available to everyone I started thinking of various ways that we could capitalise on the Customer Match feature. One of the main benefits for using Customer Match in AdWords is the fact that you can adjust your bids according to the email list that you have uploaded. It could be that you want to exclude your existing customers from seeing your adverts or you could want to bid higher for people who have enquired but not yet converted. This is the beauty of Customer Match where it works in the same way as remarketing audiences, you have huge flexibility when it comes to bidding strategies. If you are running ads on the Search Network, you can make use of Customer Match by tailoring the ad text depending on the email list that you have uploaded. Let’s say for example that you want to encourage people who have downloaded a whitepaper to move onto the next stage in your sales funnel. When they are searching on Google (for terms you specify), you can show different adverts to that audience enticing them to get in touch with a discount or last minute offer that you might not want brand new visitors to see. 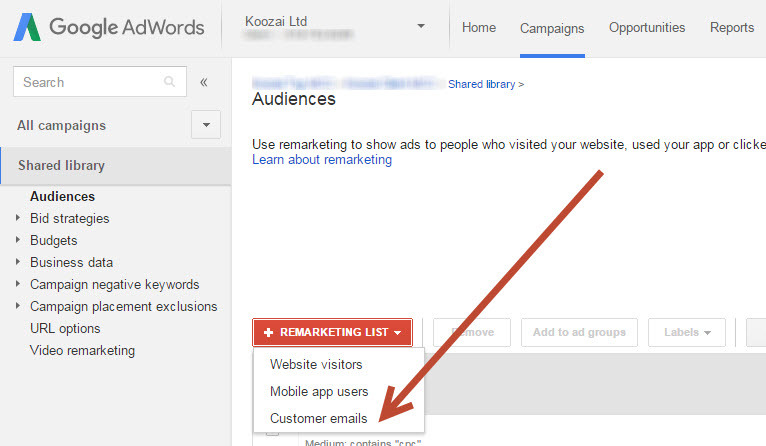 Gmail ads are one of my new favourite AdWords features especially because you can target ads to people when they are reading emails from your competitors. A sneaky but effective tactic when it comes to GSPs. This coupled with Customer Match will be amazing! Imagine you have an email list of prospects who have yet to decide if they want to buy from you or a competitor. You can upload this list and target them when they are reading emails from competitors and entice them back into your site with an eye catching ad and an offer that they can’t refuse. Companies often launch Loyalty Programmes for their existing customers and previously their main methods of communicating this was via email, direct mail or telephone. Now you can actually reach your customer base when they are searching on Google, reading emails on Gmail or browsing videos on YouTube. With this in mind, you can get really creative and encourage your customer base to join your loyalty programme when they are least expecting it. If your business is based on repeat customer purchases, you could make great use of YouTube Trueview adverts by showing customers new products that you have available that might be of interest to them. This could work really well for immediate upsells and cross-sells too. Let’s take a mobile phone retailer as an example who has just sold someone the latest iPhone but when they made that purchase they did not buy any extras like a phone case or screen protector. Upload a list of customers who match the same criteria and target them with ads across various networks enticing them to purchase the essential added extras. When you upload an email list to AdWords, Google will be able to match those users to their database and will understand a lot about the demographics and interests of that audience. Using this, they will automatically create Similar Audiences that you can use in your remarketing strategy on Gmail and YouTube. This is a great way of uncovering a new audience that you may not have exposed your brand to yet. As I mentioned at the start of this post, AdWords is slowly rolling the feature out to everyone. To check to see if this is available in your account yet simply hop on over to the Shared Library in your account and click on Audiences. Click to add a new Remarketing list and if you get an option for Customer Emails in the drop down then you are good to go. I will be writing a follow up post in the future about Customer Match once we have been able to implement this across our client accounts. I am definitely looking forward to seeing what the results are like off the back of it. If you have run a similar campaign, it would be great to hear your thoughts on the feature and how it went for you so please do leave a comment in the section below. Great blog Samantha – I’m looking forward to the follow up! When using customer match to target people on the Search Network, does the campaign targeting include both the email list alongside keywords? So that ads only show when customers are searching for relevant search terms? Looking forward to trying this myself! Glad you liked the post. Yes, when you target on the Search Network you will need to include keywords in the campaigns too and then apply the email list as an audience in the same way as you would with RLSAs. Does that make sense? Yes, totally! I presumed you would need to do that to maintain relevance of ads to search queries! Great write up Sam. I think this will be great for targeting lapsed customers which could be enticed back with an exclusive discount code etc… especially those who are not responding to promotional emails.